Ubisoft is one of the world's biggest publishers of video games, so it stands to reason that its E3 conference is going to garner plenty of attention. The really odd thing is that with the exception of a couple of games, we already had a good idea of what was coming – and the lack of surprise wasn't helped by the fact that Ubisoft decided to highlight new content to coming to existing titles, such as Rainbow Six: Siege and For Honor. Despite that, it was a pretty impressive showing from the French veteran if only because it displayed breadth and depth of content the company contributes to the crazy world of video games. We got a few surprise announcements and saw a bit more of games we're already looking forward to playing in 2018 and beyond. Oh, and there was a dancing panda. Can't forget that. While there was an awful lot of CGI and scripted cinematics on display, Ubisoft struck a fairly decent balance between showcasing actual gameplay as well as glitz. Skull & Bones – Ubisoft's attempt to take down Rare's Sea of Thieves – serves as a good example. The atmosphere was set perfectly by some well-rendered story sequences before charging headlong into a condensed gameplay section which showed all the elements of a typical raiding mission. You identify your target, visit wrecks to steal flags to fool nearby forts and then stalk and eventually outflank your foe to deliver a killing broadside before boarding and looting the vessel – you then enlist the help of other pirates to make sure that those pesky Portuguese frigates don't get their hands on your ill-earned gold. It was a beautifully conceived piece of showmanship on Ubisoft's part, although we dread to think what kind of power the PC that was running it must have. The finely-tuned footage certainly succeeded in getting us excited, and a similar approach was taken with Assassin's Creed Odyssey, arguably the game of Ubisoft's conference. Fancy CGI can only drum up so much anticipation; sometimes it's wise to allow the game itself to do the talking for you, and Ubisoft clearly knows that – who could forget that legendary Watch Dogs demo? Elsewhere, Trials Rising will have pleased fans of Trials (well, duh) and The Division 2 got plenty of airtime via a dramatic rendered introduction and some short in-game action sequences. These are Ubisoft's key titles for the next 12 months and we can't wait to play them – so mission accomplished, basically. First impressions count and Ubisoft made a terrible one this year. The show kicked off with a choreographed routine to promote Just Dance 2019, which turned the cringe-ometer all the way up to eleven and featured a poor unfortunate soul in a panda suit. 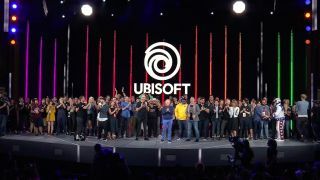 You can't really blame Ubisoft – after all, the franchise continues by the truckload – but the sequence went on for far too long, contained no gameplay footage and basically bored those in attendance to tears. Not the best start. Perhaps it was a stroke of genius in that respect; the only way was up, and had Just Dance 2019 been shown later on the conference, we may well have seen rotten fruit pelted at the stage and mass walkouts. The amount of screen-time given to old games was also a bit of a downer. We understand that 'games as a service' is a pretty hot concept right now, but featuring Rainbow Six: Siege, For Honor and Mario + Rabbids felt like a misstep, especially when people are hungry for new experiences and fresh games. Having said that, it's noble of Ubisoft to give these existing releases all of this fresh content, and it bodes well for the longevity of Ubisoft's catalogue in general. Finally, we can't fathom why Ubisoft thought it was a good idea to tease gameplay footage for Beyond Good and Evil 2 but not give it the full-screen treatment at the conference. There's a behind-closed-doors demo available at the event, but it would seem that the company isn't confident enough to let the general public loose on it quite yet, which is a shame. Despite the presence of not one but two Hollywood stars (Joseph Gordon Levitt and Elijah Wood), the most jaw-dropping moment of the entire conference revolved around a hunk of plastic shaped like a spaceship. Ubisoft's take on the toys-to-life concept (yes, it's still a thing), Starlink: Battle for Atlus, was another game we'd already become acquainted with thanks to its announcement at last year's event, but it had a secret weapon this time around: Fox McCloud. There were audible gasps of amazement when it was confirmed that Star Fox hero McCloud would be joining the ranks of Starlink to help liberate Atlus, but it was the appearance on-stage of Nintendo's very own Shigeru Miyamoto, who was awarded a sample of Fox's Arwing toy that will launch alongside the Nintendo Switch version of the game. This one was actually tough to choose, because both Skull & Bones and Assassin's Creed Odyssey put on really strong showings with loads of lovely gameplay footage to gaze at. We'll have to go with the latter because we simply cannot wait to run riot in Ancient Greece – effortlessly one of the downright coolest locations the series has picked thus far. Not only is the setting compelling, it seems that Ubisoft has built on the good work seen in Assassin's Creed Origins to craft an epic RPG adventure, where your choices and actions have a lasting impact on the narrative. You can select from one of two characters (we already can't wait to play as Kassandra) and you'll even get to meet legendary historical figures along the way – the demo showcased a chucklesome exchange with none other than Socrates himself (known to his close friends as the Hairy Baklava).